In the absence of well-functioning public tran sfer systems and safety nets, the family acts as the key provider of income and support through the intergenerational redistribution of resources. In this paper we use micro-level longitudinal data and a mix of methodologies to document the life-cycle patterns of financial transfers in a rural, sub-Saharan African population. Underneath a well-established age-pattern of intergenerational transfers in which transfer patterns change according to broad stages of the economic life cycle, our analyses document significant heterogeneity and fluidity: Intergenerational transfers are variable and reverse their direction, with individuals moving between the provider and recipient states repeatedly across their life course and within each major stage of the life-cycle. Contrary to common perceptions about family transfers ameliorating short-term shocks, transfers in our analyses are driven primarily by demographic factors such as changes in health, household size, and household composition, rather than short-term events. Overall our analyses suggest that the role of transfers in this rural sub-Saharan context is significantly more complex than suggested by theories and evidence on aggregate transfer patterns, and at the micro-level, intergenerational transfers encapsulate multiple functions ranging from direct exchange to old-age support in the absence of a public pension system. Paper: Payne, Collin F., Luca Maria Pesando, and Hans-Peter Kohler. 2019. “Private Intergenerational Transfers, Family Structure, and Health in a sub-Saharan African Context.” Population and Development Review. Cognitive health is an important dimension of well-being in older ages, but few studies have investigated cognitive health in sub-Saharan Africa’s (SSA) growing population of mature adults (= persons age 45+). We use data from the Malawi Longitudinal Study of Families and Health to document the age and gender patterns of cognitive health, the contextual and life-course correlates of poor cognitive health, and the understudied linkages between cognitive and physical/mental well-being. We find that women have a substantially higher burden of poor cognitive health than men, and experience a steeper decline of cognition with age. Increased presence of strong social ties and exposure to socially complex environments is associated with higher cognitive health, as is higher socioeconomic status. Poor cognitive health is associated with adverse social and economic well-being outcomes such as less nutrition intake, lower income, and reduced work efforts. Lower levels of cognitive health are strongly associated with increased levels of depression and anxiety, and are associated with worse physical health measured through both self-reports and physical performance. Our analyses are one of the first investigations of cognitive health in a population-based sample of older-adults in a SSA low-income population, and demonstrate that poor cognitive health has substantial repercussions for the rapidly growing population of older adults in SSA. Paper: Payne, Collin F., Iliana Kohler, Kathy Lawler, Chiwoza Bandawe, and Hans-Peter Kohler. 2017. “Cognition, Health, and Well-Being in a Rural Sub-Saharan African Population.” European Journal of Population. importance for understanding the consequences of population aging, the evidence about the prevalence of disabilities and functional limitations due to poor physical health among older adults in SSA continues to be very limited. We investigate how poor physical health results in functional limitations that limit the day-to-day activities of individuals in domains relevant to this subsistence-agriculture context. Participants came from 2006, 2008, and 2010 waves of the Malawi Longitudinal Survey of Families and Health, a study of the rural population in Malawi. These disabilities were parameterized based on questions from the SF-12 questionnaire about limitations in daily living activities. We estimated age-specific patterns of functional limitations and the transitions over time between different disability states using a discrete-time hazard model. The estimated transition rates were then used to calculate the first (to our knowledge) microdata-based health expectancies calculated for SSA. The risks of experiencing functional limitations due to poor physical health are high in this population, and the onset of disabilities happens early in life. Our analyses show that 45-y-old women can expect to spend 58% (95% CI, 55%–64%) of their remaining 28 y of life (95% CI, 25.7–33.5) with functional limitations; 45-y-old men can expect to live 41% (95% CI, 35%–46%) of their remaining 25.4 y (95% CI, 23.3–28.8) with such limitations. Disabilities related to functional limitations are shown to have a substantial negative effect on individuals’ labor activities, and are negatively related to subjective well-being. We find that Individuals in this population experience a lengthy struggle with disabling conditions in adulthood, with high probabilities of remitting and relapsing between states of functional limitation. Given the strong association of disabilities with work efforts and subjective well-being, this research suggests that current national health policies and international donor-funded health programs in SSA inadequately target the physical health of mature and older adults. Paper: Payne, Collin F., James Mkandawire, and Hans-Peter Kohler. 2013. 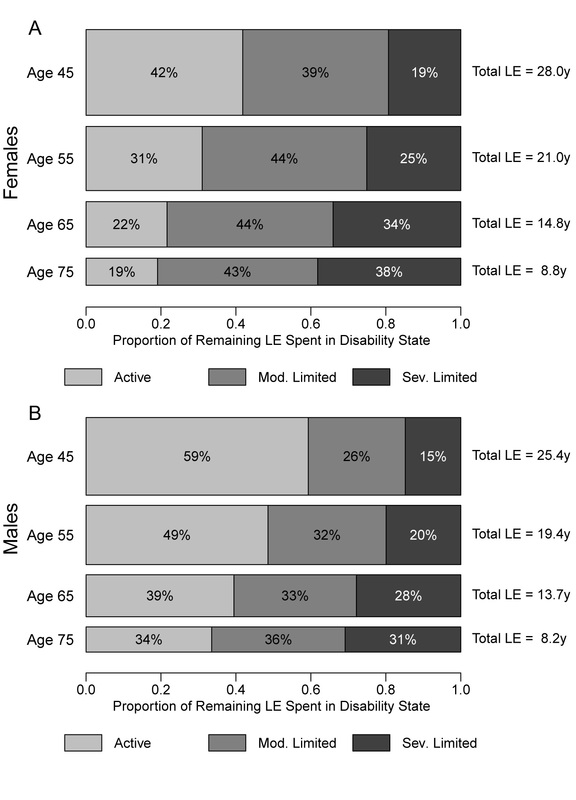 “Disability Transitions and Health Expectancies among Adults 45 and over in Malawi: A Cohort Modeling Approach.” PLOS Medicine 10(5). Aging in the Americas: Disability-Free Life Expectancy among Adults Age 65 and Older in the United States, Costa Rica, Mexico, and Puerto Rico. This article compares the burden of self-care disability and disability-free life expectancy between Mexico, Puerto Rico, Costa Rica, and the US, with the goal of understanding the future health-care needs of Latin America’s growing elderly population. This paper engages with the current debate in the literature on health conditions of the elderly population in Latin America and the Caribbean (LAC), a region which has experienced a massive increase in life expectancy in the past 40 years. Most theories of aging assume that increases in life expectancy will lead to an expansion of healthy life, but many researchers argue that exposure to poor early-life conditions may lead to a stagnation or decline in disability-free life among the elderly in LAC. 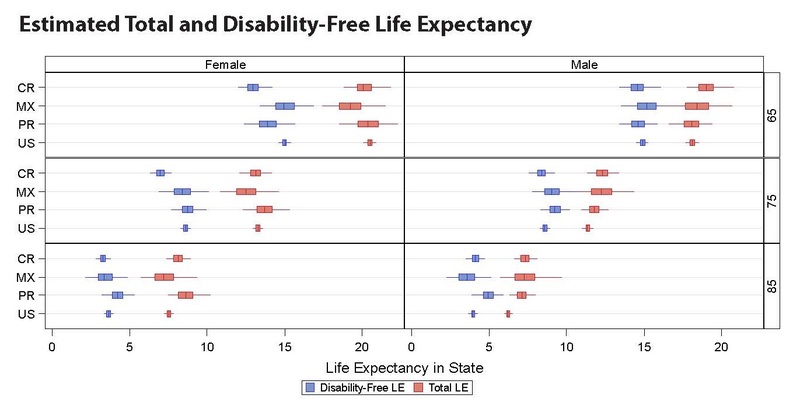 I use multistate life tables based on high-quality longitudinal sample survey data to model life expectancies with and without physical limitation, and find that disability-free life expectancy among the elderly populations in Mexico, Puerto Rico, and Costa Rica is comparable to the US. Successive generations have spent less time subject to poor early-life conditions, suggesting that health conditions among LAC’s elderly population may indeed improve in coming decades. A number of recent studies have shown that increasing access to antiretroviral therapy (ART) is increasing life expectancy (LE) in sub-Saharan Africa (SSA). However, most existing studies rely on health and demographic surveillance sites (HDSS) which may not be representative of on-the-ground conditions in much of SSA. In addition, evidence on the effect of ART on population morbidity is limited. Using data from the Malawi Longitudinal Study of Families and Health, we estimate the effect of the 2008 introduction of ART on LE and population morbidity in a geographically dispersed sample that reflects the heterogeneity of rural Malawi. We analyze LE using the Kaplan-Meier estimator, and estimate the prevalence rate of poor health using Poisson regression. In the four years following the roll-out of ART, LE at age 15 increased by 3.1 years (95%CI 1.1,5.1), and median length of life rose by over 10 years. Mortality rates declined among males and females, in all three regions studied, and more strongly among those with more formal schooling. 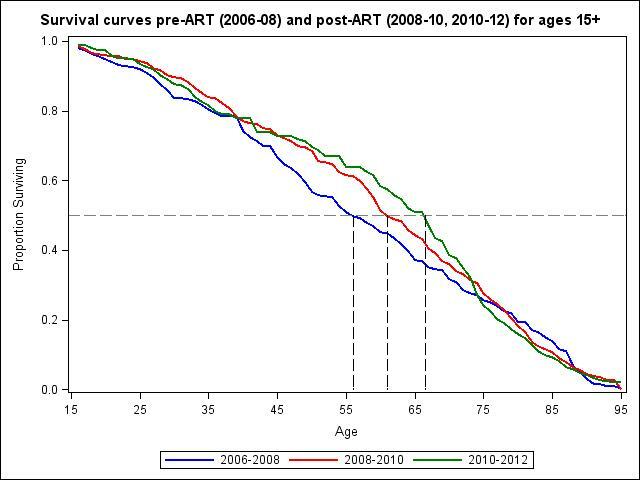 Prevalence rate ratios for poor health dropped by over 30% post-ART in ages 15-59y. Our results provide support that the increased availability of ART resulted in a substantial and sustained reversal of mortality trends in SSA, and assuage concerns that the post-ART reversals in mortality are not be occurring at the same magnitude outside of specific HDSSs.